The mass media has spent the past several years – and, in particular, the past few weeks – scaring the wits out of little kids around the world. It’s been telling them the Earth is in imminent danger of environmental collapse, that they live on a planet in peril, that the Copenhagen UN-sponsored climate summit was our last chance to avert disaster. But as adults of a certain age know, we’ve heard this all before. 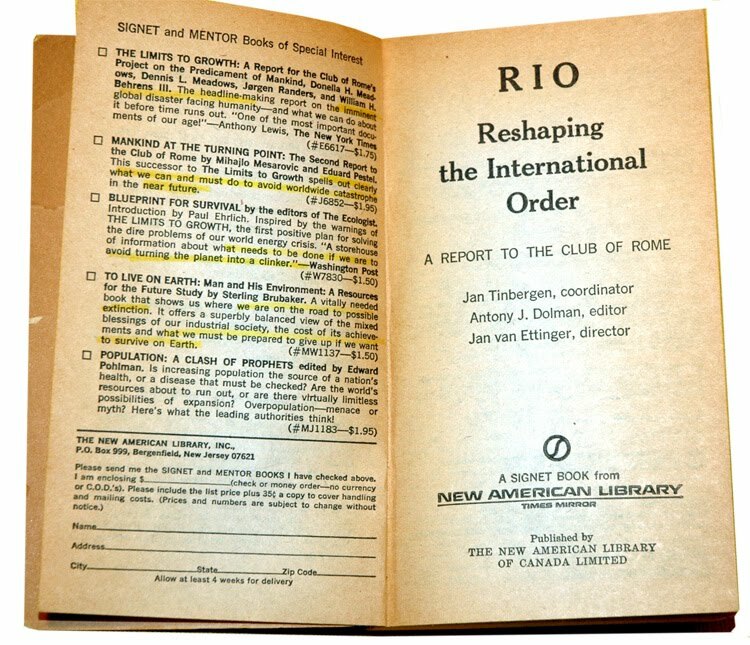 Above is a 1976 paperback (click the image for a larger view) titled RIO: Reshaping the International Order. Thirty-three years ago there was no climate change crisis. Then, the concerns were over-population, Third World poverty, and nuclear weapons. Nevertheless we were told there was an urgent need to win a “global race for survival” and that Westerners would need to “give up” aspects of their affluent lifestyles in order to make this happen. That’s right, folks. 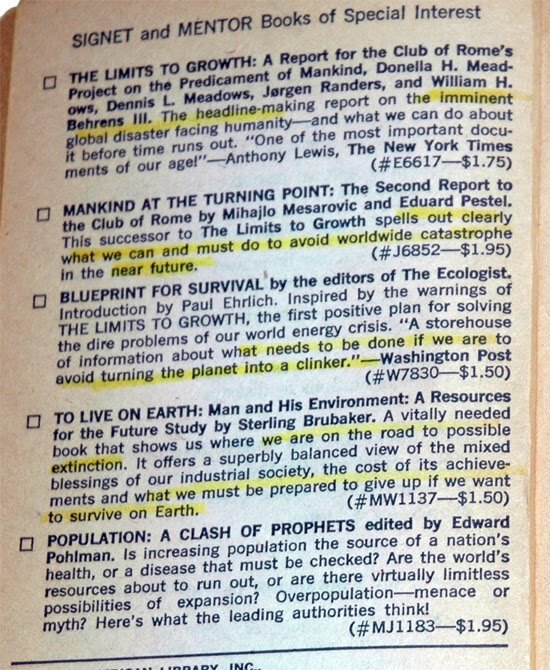 Back in 1976, people were yammering on about the “global disaster facing humanity,” about “worldwide catastrophe” in our “near future,” about how we’d end up extinct if we didn’t stop being so greedy and environmentally irresponsible. …declare that all consumption beyond that…is not only waste but a conscious action against the welfare of large numbers of poor and disprivileged, their own children, and the prospects for a peaceful world. In 1976 it was being implied, as does the writer Thomas Friedman today, that China was superior to us since it had allegedly “shown that development can be built around people and geared to meeting their needs” (page 97). Then, as now, we were assured we had a savior: “the United Nations remains the only real machinery with the potential for constructing a fairer world” (p. 124). Despite the fact that most people hadn’t yet imagined powerful and liberating technologies such as home computers, the Internet, cell phones, and consumer GPS devices, readers in 1976 were warned against indulging in “wild and totally unwarranted technological optimism” (pp. 199, 373). Finally, then, as now, we were advised that: “Radical action is urgently needed” (p. 371) in order to stave off “threats of imminent disaster” (p. 375). Attention professional doomsayers: just cool it, OK? Stop giving little kids nightmares. This entry was posted on December 20, 2009 by Donna Laframboise in historical perspective, intro, media, predictions that failed and tagged China, Club of Rome, historical perspective, predictions that failed, RIO: Reshaping the International Order, Thomas Friedman.